Growing up, Boston Market was known as my spot for some juicy and tender rotisserie chicken (plus all the fabulous fixings on the side, especially that to-die-for cornbread). But now I hear they have expanded their offerings to the other white meat - beef! Available for a limited time, Boston Market is offering its new Rotisserie Brisket at participating locations while supplies last. On Monday and Tuesday evenings starting at 5 p.m., guests can relish in the delicious flavors of their tender brisket, which has been slow-cooked in their famous rotisseries. Each Rotisserie Brisket Individual Meal is served with a side of smoky hickory BBQ sauce, choice of two regular sides and fresh-baked cornbread starting at $13.99. In addition, Boston Market has extended the availability of its popular Rotisserie Prime Rib from three to five days a week. 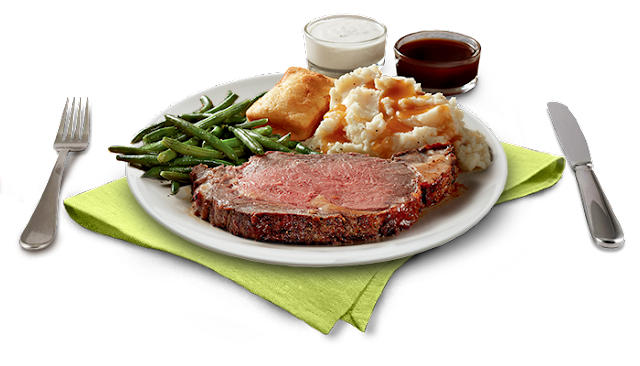 Guests can now enjoy USDA Choice Prime Rib individual meals after 5 p.m. on Wednesday, Thursday, Friday and Saturday evenings and after 12 p.m. on Sunday at participating locations. To check which locations are participating in these two deals, go to bostonmarket.com (NYC based readers - I already did the diligence and YES - the brisket and prime rib are both available in the Manhattan restaurants! ).